In ICESTARS, for the first time, a truly generic multi-device VoHB algorithm was coded and has been tested for circuits larger than plain single-transistor power amplifiers. 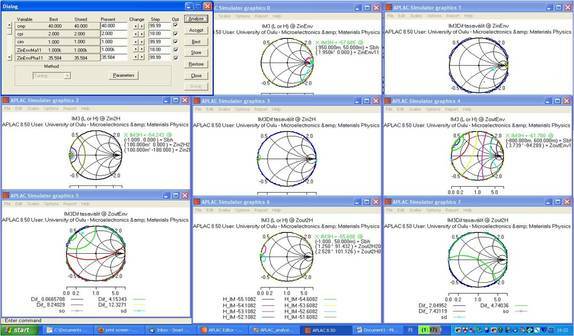 Volterra-type analysis is used for detailed distortion analysis especially needed to design linear power amplifiers. It has been extended to multi-device circuits with significant speed-ups. The main advancement in the VoHB technique has been the APLAC AIF interface enabling important new features, amongst others, improved convolution algorithm (coping with multitone excitations), direct calculation of the response of the circuit for calculated nonlinear Volterra current or the calculation of distortion contributions for each HB frequency. The VoHB algorithm is implemented using a function interface AIF that allows C-language access to many internal functions and data structures of APLAC, including the complete circuit matrix, and input and output signals of the VCCS sources that constitute all device models in APLAC. The analysis results of VoHB are used to find the dominant cause of distortion, available cancellation mechanisms, design guidelines to minimise distortion, e.g., by tuning the harmonic matching impedances and causes of bandwidth-dependent memory effects, that complicate the design of digital pre-distortion systems, for example. VoHB analysis tests have been carried out for power amplifier circuits. First, test have been run using the old APLAC input language based models. These results were then compared to the results that the new APLAC analyzer interface (AIF) model produces. Volterra-on-Harmonic Balance (VoHB) is a technique developed by J. Aikio at Oulu university. It enables to see a detailed construction, dominant causes and cancellation mechanisms of nonlinear distortion in analog circuits. VoHB is further evolved in ICESTARS. The distortion analysis algoithm called Volterra on Harmonic Balance (VoHB) breaks the total nonlinear distortion (given by harmonic balance) to a vector sum of smaller components so that the dominant causes, mixing and cancelling mechanisms can easily be seen. This is done for each nonlinear element and a polynomial presentation is fitted in the frequency domain. These polynomial expansions are then used in Volterra analysis to calculate different mixing mechanisms from one tone to another. For both fitting and the expansion frequency domain convolution is used.